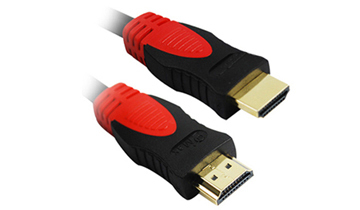 ULTRA SERIES Dual Tone Extreme High Speed HDMI Cables with Ethernet Gold Plated Connector. Lengths: 10ft (black/red). HDMI Ethernet Channel: This adds internet and home network connectivity to HDMI, Transfer speed up to 100 Mb/sec. Audio Return Channel: What this feature provides is a single HDMI connection between a TV and a home theater receiver that can not only pass audio/video signals from the receiver to the TV, but also pass audio origination from the TV's tuner to the receiver. 3D Over HDMI: Designated to accommodate the future 3D, with the capacity of passing two simultaneous 1080p signals using one connection. 4Kx2K Resolution Support: The HDMI 1.4 Cable accommodates the future resolutions 3840x2160 and 4096x2160 high definition pixel resolutions.